Continuing the ongoing series of interviews with creative artists working on various aspects of movie and TV productions, it is my delight to welcome Anastasia White. 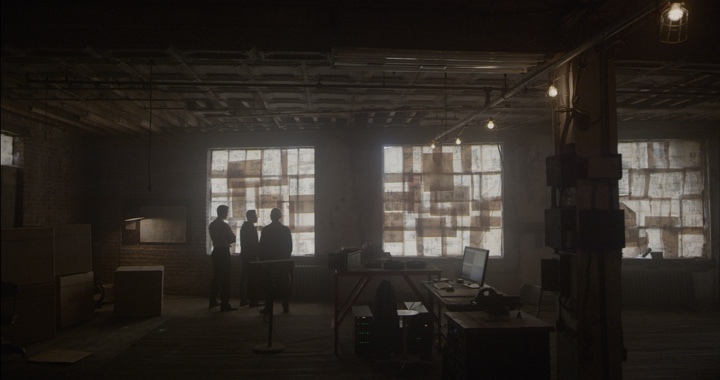 After doing art direction on the pilot episode of “Mr Robot”, she joined the second season as the show’s production designer. 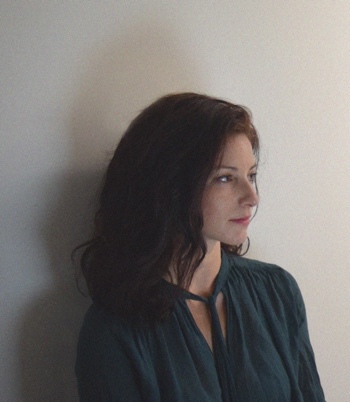 In this interview Anastasia talks about her first memories of working on movies, her journey through the various roles in the art department, the arc of a production from initial explorations to watching sets being torn down at the end, and evolving and extending the Mr Robot’s universe (including the delightful trip down the memory lane back to the ’90s for an especially wonderful twist). Kirill: Please tells us about yourself and your path so far. Anastasia: Throughout college I was in the music business as a side job. While I was there, I realized that I wanted to do something a little bit more creative, and I left music industry when I graduated college and went to a graduate architecture school. I wanted to create more and be more artistic, but I eventually left that as well [laughs] as I didn’t like the structure of everything. 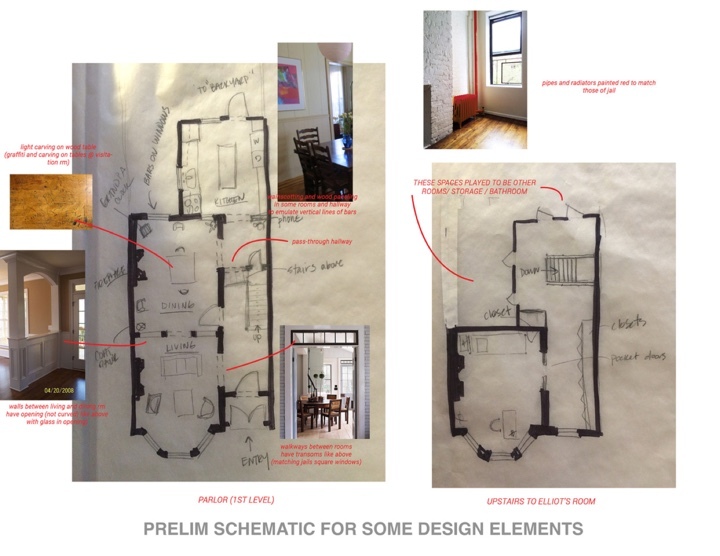 I worked for a couple of years for an architecture firm that did interior design. When the economy went bad, I was laid off along with more than half of my office. The day I was laid off I had a trip planned to New York. I always wanted to live in New York, and I thought it would be my chance to get a job there [laughs]. When I came back, I spent two-three months researching what types of careers I could move towards with the skills that I had from the architecture school. I never went to a film school, but it sort of presented itself as something interesting that I thought I could do. I researched the production designers that were based in New York City, hoping to get an apprenticeship. Mark Friedberg was the one I wanted to work for, and luckily when I reached out to him, he got me a PA job within about a month. I did a few projects with him as a PA over the next two years, and I thought that art department coordinator was the next logical step. I wanted to learn about what everybody does, how to work with the budget, etc, and that’s what I did for about a year. While I was doing that, I started drafting and doing graphics as an assistant art director, and continued working my way up really. Kirill: If I can bring you back to those few months in this field, do you remember what was the biggest surprise for you as you saw how productions work from the inside? Anastasia: I think it was seeing how many people are involved in each department, and how much detail goes into everything. I thought that since it’s on camera, and the audience is so far removed from everything, that these tiny details wouldn’t be noticed. And then pretty quickly I realized that they do matter, even more than a lot of other things. Kirill: Has working in the industry ruined, in some way, the enjoyment of going out and seeing a movie in the theaters, as you know that what we see on that screen is not real, in a sense? Anastasia: Definitely. I try to keep myself removed from all that. But if I love a set, I will keep my attention on the way it is framed, or the color palette. I will also start thinking if it was built on stage, or shot on location. I do that all the time, no matter what. It’s hard for me not to think about it. If there’s a tense moment or a very fast moving sequence, I’ll be taken out of it. But I always go back to think about the sets, unfortunately [laughs]. Kirill: When you look back at your earlier productions that are a few years into the past, what stays with you? Are those the good parts that you remember, or the stressful ones? Anastasia: I remember both. The stressful parts end up fading. I know that I was stressed on every job that I’ve done so far, during certain moments of it. If it’s a big stress, it stays with me, but if it’s the general stress, my memories are just that I worked a lot. I also remember the rewarding moments, and things that were fun to work on. I learn from everything. If I was stressed about something in particular, I don’t think I’ll be stressed about that particular thing again in the future. I learned from it. I learned how to not create stress around it. Kirill: Is there such a think as a production with no stress? Anastasia: There are productions that have, perhaps, a couple of stressful days. I don’t think there’s a production that is stressful every single day from the very beginning. I think there are certain anxieties that go away with experience. Kirill: What do you tell people when they ask what you do for a living? How do you tell people that somebody needs to think about every single thing that is seen by the camera, no matter what time period the story is set in? Anastasia: Often, when people ask that question in passing, I say that I do set design. Most of the time they don’t ask any further than that, unless they are really interested. I think the impression that it creates is that it’s more about set dressing, like furniture and colors. Honestly, it’s quite rare that people ask me to go into the details of everything. It’s so complicated to explain every part of the job, and how many people there are in the art department. I talk about set decorators, props, construction, scenic, graphics, and that helps people understand a little bit more. Kirill: Now that you’re the head of the art department as the production designer, does it help that you started out learning your way through all those different positions in the department? Anastasia: I think so. It definitely helps me see what my crew is doing, to understand and to communicate with them a lot better. I can read the plans, and I know exactly what little changes should be done on a drawing so that what I’m envisioning can happen correctly. It saves time. I can do something in a pinch. If I’m scouting or out of the office, I can always make those little change on my own. If there’s a last minute graphic that needs to be done, and everybody is off the clock, I can do that as well. As far as my coordinating background, it’s nice to know how money is allocated. I was doing it while I was art directing. It’s nice to know all the details even though I’m not thinking about them constantly. Kirill: How does it work with the structure of the art department? Are there well defined responsibilities for the particular positions or roles? Anastasia: The lower-budget jobs are different. There’s less crew, so everybody has to do more. It depends on the job, really. On “Moonrise Kingdom” I was helping with drafting, graphic design, research and some other things, for example. And on other jobs it’s more compartmentalized. 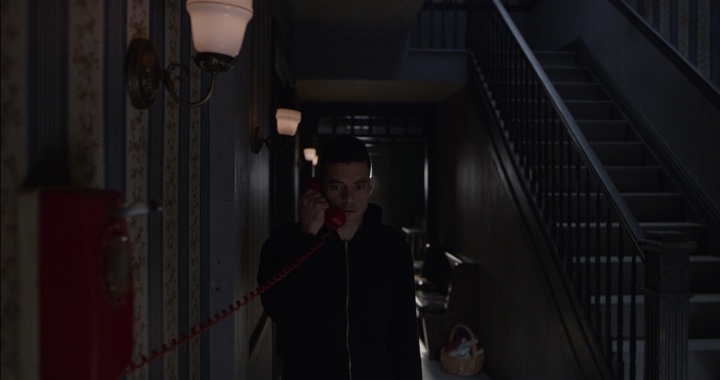 Kirill: Moving on to “Mr Robot”, how did it start for you with the pilot for the first season? Did you have any hesitations joining an episodic TV production? Anastasia: I worked with the production designer of the pilot on a couple of other projects, and he brought me as his art director. I was a little hesitant, as in general I prefer film. 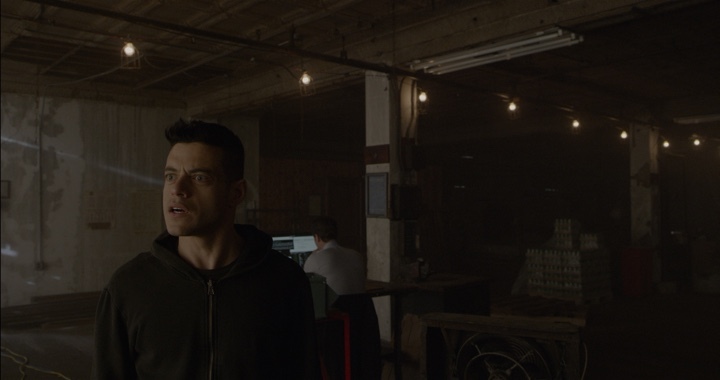 It feels like now there are so many good TV shows, but I didn’t know if “Mr Robot” would be one of those shows. But since it was a pilot, and a rather short job, I thought that it could be interesting. I’m glad that it ended up being such a good show. Kirill: So on a pilot you’re building the world without knowing for sure if the show will be greenly. Anastasia: Correct. 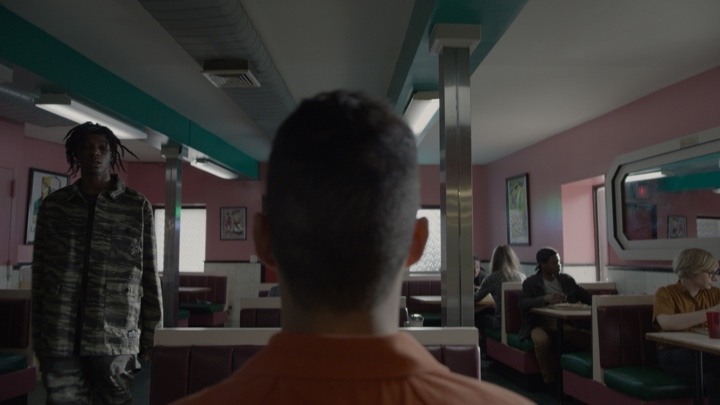 Sam Esmail didn’t direct the pilot, so he worked with the director as well as with the very talented Matthew Munn, the production designer. It was a lot of research, and getting ideas from the script and Sam about the direction and the tone of the world. Kirill: How was it come back as the production designer for the second season, as you’ve helped build the original world of the show? Anastasia: There were some recurring sets, and I already knew the tone of the show. I wanted to respect the established look, and recreate the sets exactly as they were. As for the new sets, I wanted to bring my own ideas to the table. It was fun to do that, to keep it in the same world so that the new sets were not completely disassociated from the first season. It was nice to create more of the character-driven colors, spaces and ideas. It was also a new storyline that followed a different direction, going more with the individual. Kirill: So the sets that were in the first season were left unchanged. Do they sit somewhere on the studio lot in between the seasons? Anastasia: We have to tear everything down, and then rebuild everything every single season. Kirill: A season has its story arc, but then there’s also the larger story arc across the entire show, for however many seasons it will eventually run. Are you worried about seasons looking slightly different, or is that a natural part of how spaces evolve on or off screen? Anastasia: It’s just the nature of it. The storyline here is that the world is changing because of the hacking, and what happens further along with the economy. I’m not too worried about that. The sets that were established in the first season are not going to change much, aside from what the characters do to their own spaces. Places change over seasons, people change, and it doesn’t worry me. Kirill: As you were working on this season, did you know in advance about all the new spaces that you needed to build? Anastasia: I had a pretty good idea about the bigger pieces, and I was able to plan around that. I didn’t know every single element, but rather about the major story line and what we’d be looking to build. Kirill: How much time out of the year did you spend on the second season? Anastasia: I was on it for seven months total. Kirill: The more “traditional”, if you will, episodic story telling would have 22-23 episodes in a season, but we’re seeing much shorter story lines that span across 8, 10, or 12 episodes on these high-quality productions. Would you say that the amount of work that goes into such a season makes it impossible to squeeze in more episodes? Anastasia: I think if they want to release the show every year, it would be really hard. We’d probably be shooting for the whole year, which would delay the release even further. Our schedule is already so packed, even with only ten episodes. It’s a challenge. Schematic of Elliot’s townhouse. Courtesy of Anastasia White. Kirill: [Spoiler alert] The biggest spoiler of this season happens halfway through it, as most of what has happened is revealed to take place inside of Elliot’s head while he was in the prison. Did you plant anything into those sets to hint, perhaps, at their nature, or where those just “regular” sets? Anastasia: We kept them as regular sets mostly, with some thematic hints. People on Reddit already discussed the vertical elements of the townhouse. We scouted the prison before we built his mom’s townhouse. So we used the geography of that to inform the layout of the townhouse, but luckily that also lent itself to how regular Brooklyn townhouses are built and laid out. 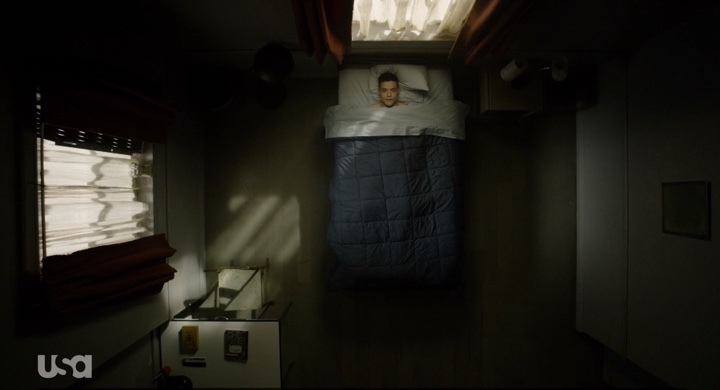 His bedroom was small, and I don’t think that Elliot would decorate his room much anyway. The basketball court, the mess hall, the chapel and other locations were tied in together to feel roughly similar. 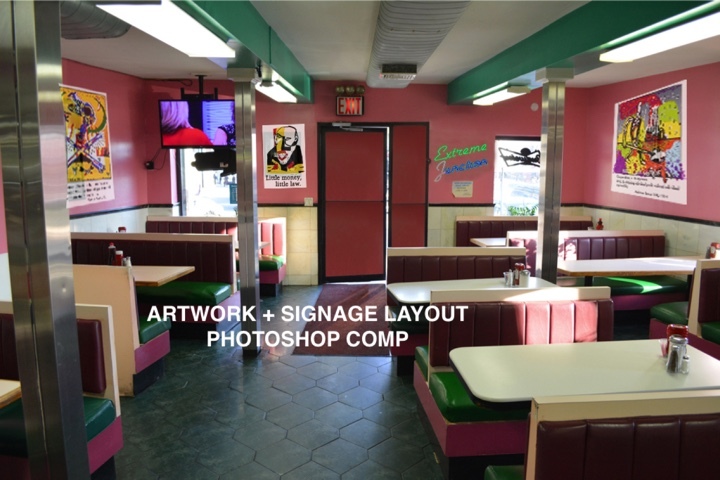 Schematic of cafeteria / diner. Courtesy of Anastasia White. 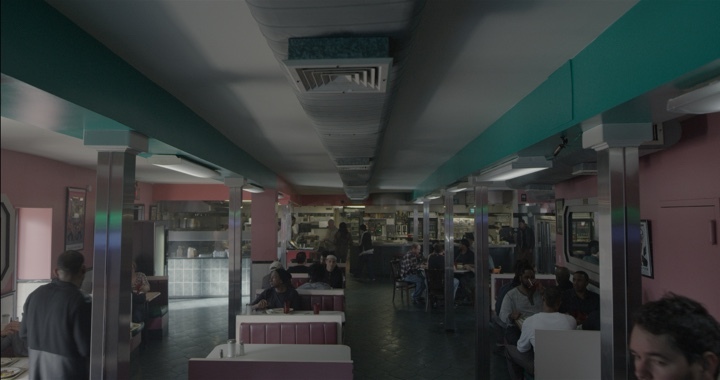 Cafeteria / diner final still. Kirill: As you work on all the episodes of the season, would you consider yourself to be one of the people responsible for the consistent visual look as it progresses? Anastasia: I like to think so. 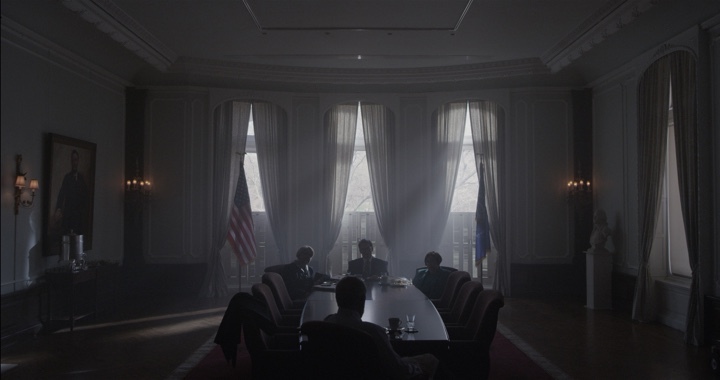 I work closely with Tod Campbell the director of photography, and Sam Esmail. We’re constantly discussing things with the writers. I ask them about the characters and the progression of everything as I’m thinking about the sets, and where things are leading. Certain colors and lights stay the same for characters and spaces. Kirill: How does that work for the camera, especially on the heavily recurring sets? It might get boring for me as a viewer to see the same exact angles and takes episode after episode. Anastasia: It can be tough for Tod. We’ve been in Elliot’s apartment for a long time, and he had to constantly find new ways to shoot it. The same goes for a lot of office spaces, where he has to find ways to keep it interesting for the viewer. I think he’s really good at finding those angles. Kirill: There was a very particular episode in this season, going back to the style of what looked like a show from the ’80s. How was that described in the script, as far as the environment that you needed to build went? Anastasia: [Laughs] Before all the scripts were sent, I knew there was one episode that was going to be different. 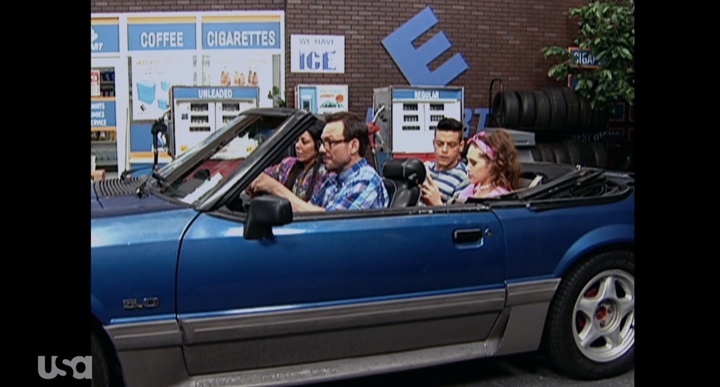 It’s a throwback to the TV shows that Elliot would have watched in the ’90s when he was a kid. I watched a lot of clips from the shows of that time – Full House, Family Matters and others. I studied the shots, as we were building the physical sets for that episode. I had to make three walls for the convenience store, and everything else was pretty flat because we were shooting with three cameras – completely different from what we usually do. Kirill: It’s interesting to hear you saying that you went to watch shows of that time to study the look of the era. Are you worried about how the work you’re doing now will be seen a few decades down the line? Anastasia: I don’t really think about it that much. I want to think about what is best for the story and how to make it interesting, or have it fade into the background if that’s what is better for the scene. Kirill: One of the more striking sets for me personally on this season was the office of E-Corp’s CEO. 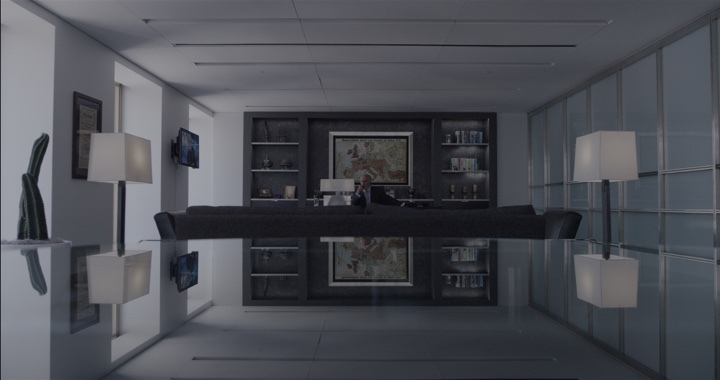 It took me a bit to understand what was going on with the edge-to-edge reflection in the shot from the other wall of that office. How shiny was that desk? Anastasia: It was pretty shiny [laughs]. It wasn’t a mirror, but just a round table with a glass top towards the back of the room. That was Tod’s idea to put the camera right there to create that interesting shot where it looks like it was mirrored. Kirill: How soon do you get to see what the camera sees? Are you there on set looking at the monitors? Are you on other sets getting them ready? Do you watch the dailies? Anastasia: I do all of those things. I usually start on set, and once I feel like everybody has figured out all the shots, I’ll watch the first couple of shots on the monitor. Then I would go and start prepping other sets, and if I have time, I’ll come back and watch a little bit more. It’s most helpful to be there watching the monitors, for sure. We also photograph the sets, and I watch the dailies. Kirill: You mentioned that the sets are torn down in between the seasons. Is that part of the job that you have to accept? Does it still pain you to see that work destroyed, as it “only”, so to say, survives in the final cut? You mentioned that you’ve worked in an architecture firm, and I’d imagine that what you did there had a much longer, physical presence. Anastasia: My sentimental attachment usually only lasts for a few days. It’s the hardest when we put a lot of effort into a set, and it only shoots for a day or two, and then comes down immediately. I try to not attach myself too much. The most important part is what is on the screen. Schematic of Black Room. Courtesy of Anastasia White. Kirill: Was it harder in the beginning of your career to see your work essentially destroyed? Anastasia: It’s actually harder now that I’m more attached to it. But I understand it. If it’s coming back, it will be back in the exact same way we had it before. And if it’s not, it’s immortalized. Kirill: How important is it for you to surround your actors with complete sets, even if some of those elements are not going to be captured by the camera? 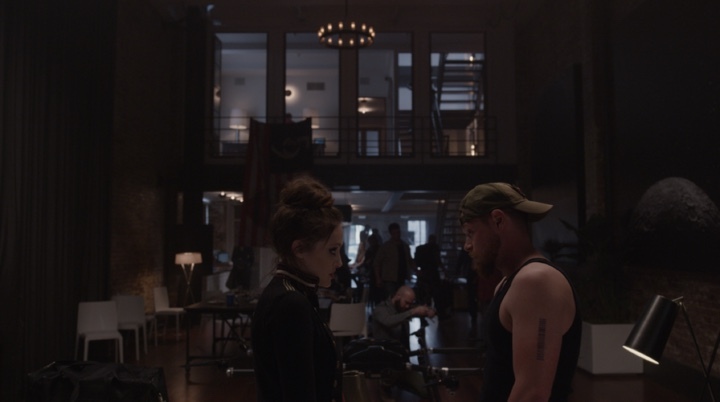 Anastasia: It depends on the job, but on “Mr Robot” for sure we’re building complete sets. We usually see everything, and they might change their mind about what the shot will be on the day. I have to be ready for them to see everything. Sam and Tod usually don’t have a chance to see the final set until they walk on the day that we’re shooting. They might find an architectural feature or like some dressing more than they thought they would, so they would change things to feature that. Or the action of the character might make more sense coming from a different side of the room. They plan the shots, but also like to keep it flexible. Kirill: Do you worry about the potential of visual effects to build complete virtual worlds, where everything is shot on green screen, and there is nothing physical or tangible for the actors on the set? Anastasia: For me it’s on a more personal level. I prefer to not watch movies that are completely CGI. I can still usually tell those apart. It’s important to use VFX for certain things, and when you use it properly to augment real sets, it’s really helpful and it looks good. I’m not worried about it too much as far as my career goes. I think that everybody will be adjusting accordingly. And I don’t know if the majority of the public would want that to happen. How fast the demand would be going in that direction? Kirill: When a CGI set doesn’t have as much detail as it, in theory, should have had, it is so easy to get taken out of that world for me as a viewer. Anastasia: I’m sure that it will change at some point. I would like to learn more about that whole world. We do work with a VFX company for small things here and there, but I don’t have a direct experience with building complete spaces. 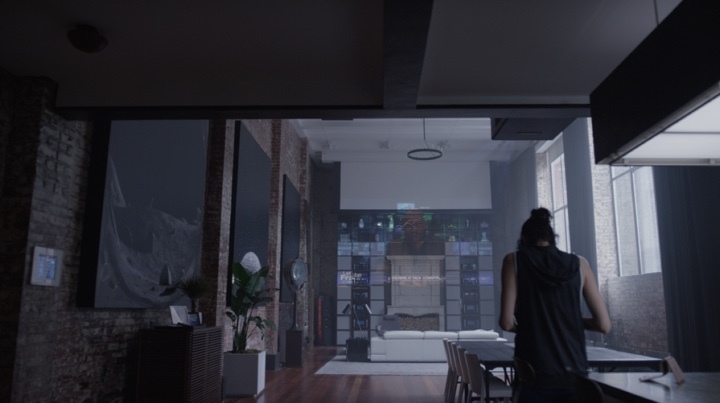 Kirill: How much of digital / VFX work are we talking about for “Mr Robot”? Anastasia: When Elliot’s reveal happened, changing from the jail to his mother’s house – we needed them to help us put the two scenes together. But it wasn’t about creating fake elements inside of the real world. Kirill: If you don’t mind me asking, what do you do between your productions? Anastasia: I love to travel, and I love nature. A few years ago I joined the Explorers Club in New York, and went on a canoe expedition looking for lost pictographs in Canada. I like to immerse myself in nature and travel while I’m not working. That’s where I find inspiration, when I have time. I go hiking, or scuba diving, or anything art/ architecture related. And if I’m traveling to a city, I try to go to as many museums and galleries as possible. Kirill: With all the pressure, and spending time away from family and friends, what keeps you going in the film business? Anastasia: I’ve been lucky to work with really great people, especially on “Mr Robot”. It’s like a whole other family. Everybody is inspiring and positive and nice to be around. I think it’s a very interesting field. It’s different every single day. I’m never staying in one spot. I’m always researching and learning new things about places and people that I never thought I would know about. We work really hard for a long period, and then I know that I can take some time off and do something for myself. It’s great to get immersed in a story and characters that are completely foreign, and to live vicariously through those worlds. It’s really challenging, but also fun even though it takes up all of my time [laughs]. Kirill: Do you get to enjoy the final fruit of such a production even though you know the script and all the sets that were involved? Anastasia: Definitely. It’s a lot better when I’m working on a production that I know is good and that I would actually watch, and that I would want other people to watch. It’s true for “Mr Robot”. Once I watched Season 2, it kind of rejuvenated me after the long hard months that we were on it. I was excited to see how it turned out, and to work on the next part of the story. 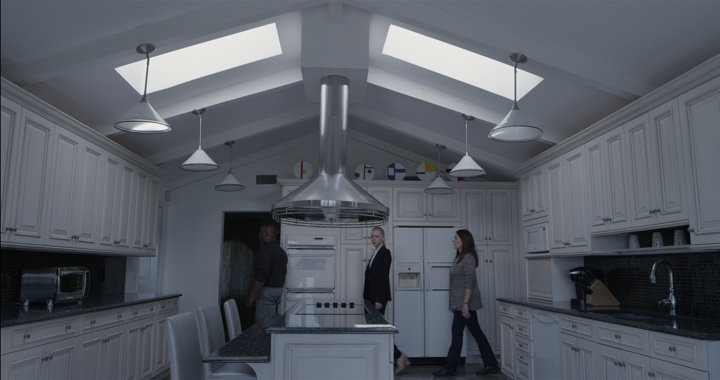 And here I’d like to thank Anastasia White for graciously agreeing to answer a few questions I had on the art and craft of production design, and on what went into creating the worlds of “Mr Robot”‘s second season, as well as for sharing the supporting imagery. The second season of the show is out now on BluRay and other physical and digital formats. Finally, if you want to know more about how films and TV shows are made, click here for additional in-depth interviews in this series. Stay tuned for more interviews in the near future!